Whether you are vegetarian or just avoiding meat for more healthy eating, you don't have to do without scrumptious Mexican food. 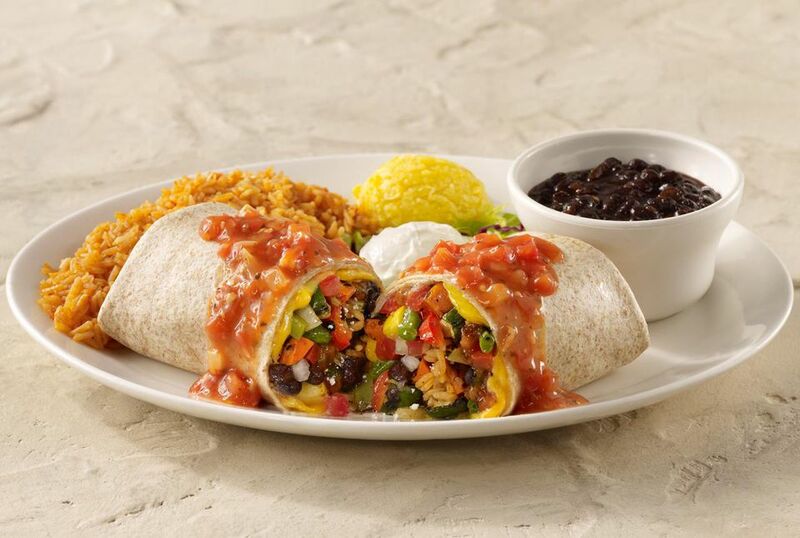 These low-fat, high-fiber vegetarian burritos are filled with a puree of sweet potatoes, black beans, onions, chilies, garlic, and cilantro. They are rolled up like enchiladas and baked. Serve topped with homemade or jarred salsa. This recipe is courtesy of "Moosewood Restaurant Low-Fat Favorites." Place the sweet potatoes in a medium saucepan with the salt and water to cover. Cover the pot and bring to a boil, then simmer until tender, about 10 minutes. While the sweet potatoes are cooking, warm the oil in a medium skillet or saucepan and add the onions, garlic and chilies. Cover and cook on medium-low heat, stirring occasionally, until the onions are tender, about 7 minutes. Add the cumin and coriander and cook for 2 to 3 minutes longer, stirring frequently. Remove from the heat and set aside. Transfer the sweet potato mixture to a large mixing bowl and mix in the cooked onions and spices. Lightly oil a large baking dish. Spoon about 2/3 to 3/4 cup of the filling in the center of each tortilla, roll it up and place it, seam side down, in the baking dish. Cover tightly with foil and bake for about 30 minutes, or until piping hot. Serve topped with salsa. Sweet potatoes are on the top of the healthy foods list. One medium sweet potato, about 5 inches long, has 112 calories and 26 carb grams, nearly 4 of which are fiber. So they are a great source of that and a tasty way to add it to your diet. Sweet potatoes are a terrific source of vitamin A, with one potato providing more than three times the daily requirement. This root vegetable is also a very good source of potassium and vitamin B6.